As Tuchel has demonstrated recently, Dortmund are prioritising the Europa League after the Bundesliga title is near-impossible to attain. He selected a very strong side despite the 2-0 aggregate score as Bender again started at centre-back ahead of Neven Subotic whilst Ginter came in for an ill Pizczek at right-back. Following their loss in Dortmund, José Peseiro made a couple of changes to his starting lineup. Marcano replaced Martins-Indi in defence, whilst the midfield saw Herrera, Oliviera and Brahimi miss out for Danilo, Evandro and Varela. These changes translated into more of a 4-2-3-1 shape as opposed to the 4-1-4-1 which they used away in the first leg. In contrast to the events of last week, Porto were the better side and started the game with much better intensity than their German opponents. Throughout their 2-0 loss in Dortmund, the side made a weak performance as they lacked pressure without the ball and in possession they were restricted to ineffective long balls towards Aboubakar with no teammates in support. Back home however, Porto were much improved in defence and were pressing Dortmund with much better pace than last week. With both wingers quite high up they held a shape which moved between a 4-1-4-1 and a 4-2-3-1 depending due to the man-orientations in midfield. They used these man-orientations well to create and maintain good defensive access as they were able to consistently apply effective pressure. The distances between the two midfields were much shorter as the man-orientations allowed Porto to be in a position to press the ball-carrier and any nearby passing options. As a result, short ball circulation became much more difficult and in some cases they had to resort to long balls without the means of moving the ball forward in a more stable manner. Many of Dortmund’s attempts to move the ball upfield through the lines of midfield were squandered and they often had to turn back towards their own goal as the recipients in the centre weren’t able to turn against their marker. Porto’s press was far from perfect, as the distances in the man-orientations weren’t always sufficient but it was much improved than in the first leg where they were far too passive. Although they were still rather direct in possession, Aboubakar benefited significantly by having better support around him to receive the resulting lay-offs. Evandro played much higher than Herrera in the first leg and was able to aid Aboubakar in maintaining possession after any long passes as a recipient of the following knock-downs. Their shorter passing was also an improvement as not only did they create more situations were it became a viable option, but they circulated the ball with better speed and direction. This early showing translated into a much improved performance throughout the whole 90 minutes from Porto. Their increased defensive pressure worked well to disrupt Dortmund’s usual possession game (though you could also partially attribute that downfall to the away side themselves) who made many more turnovers in the first leg. In possession, they were able to progress the ball cleaner whether it was through long passes to Aboubakar, or through a shorter build-up with the midfield. A recent feature of Dortmund’s build-up in possession has been their structure in deeper areas. In some past matches, the Dortmund right-back has moved inside whilst Schmelzer moves up and takes up an advanced position, forming an asymmetrical defensive line. The 6 doesn’t often drop as much (though Sahin did so in his return in the first leg) and a 3-chain forms the base of the structure with Weigl and Gündogan immediately ahead. Schmelzer provides the width down the left flank and allows Reus to move inside whilst Mkhitaryan acted nearest the right touchline. Reus and Kagawa in the centre provide decent presence alongside Gündogan and Weigl whilst Aubameyang leads the line at the top. Although the spacing was not always optimal, this 3-chain worked quite well to stretch the Porto defensive line and open the passing lanes into the centre. Particularly down the left side it came into play, as Hummels’ half-space positioning would attract the pressure of Marega and open Schmelzer who could be used to progress the ball once it was moved back inside. With the two outer defenders in their respective half-spaces and Bender in between, the chain covered the width of the pitch quite well, giving Dortmund the ability to move the ball horizontally well which could help open spaces against the press even if they didn’t always take advantage. Another added benefit of this 3-chain was the presence given by both Weigl and Gündogan in the midfield. 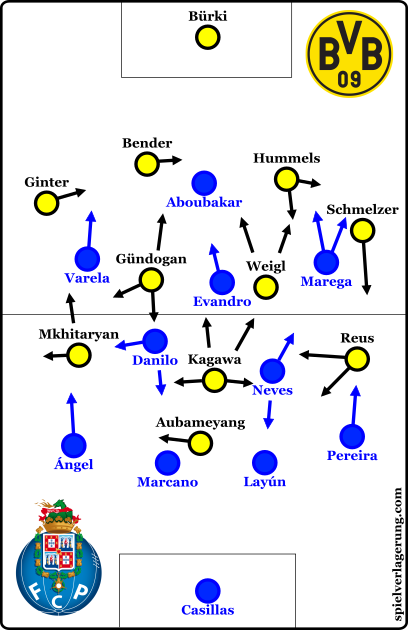 With the three-chain formed, the two pivots were only required to drop in certain situations and alternatively could stay in the 2nd line of Dortmund players. From this area they could offer for passes into the midfield and theoretically support the progression of the ball through the centre, even if their weak circulation didn’t often make this possible. Taking a 2-0 aggregate lead into the game, Dortmund’s performance suggested signs of complacency as they looked below their usual selves. The ball circulation was particularly poor as passes lacked sufficient speed and the ball moved slowly between the deeper players as they were often unable to beat the lines of pressure. Dortmund’s inability to move the ball well enough caused themselves a number of defensive problems as they quite commonly turned the ball over in spaces within their own third against an improved Porto press. The uncharacteristically high number of misplaced passes weren’t a result of other aspects such as their spacing, which was generally fine through the game. Instead it simply implied complacency as there were many unforced turnovers, particularly in attempted combinations where the passes didn’t follow the movements off of the ball. Especially after Casillas’ own goal midway through the first half, Dortmund relaxed even further with the tie virtually over as Porto now needing to score four due to the away goal rule. They were content to keep the possession for long periods of time with a clear stability-focus and the lack of pressure on Porto’s defence allowed the home side to play further away from their own goal. Out of possession Dortmund’s performance dropped too, with the pressing commonly lacking the co-ordination necessary to be effective. This theme in Dortmund’s game progressed further in the second half as Porto were increasingly further away from getting themselves back into the game. After the break Tuchel introduced Sahin and Subotic as he looked to gave them playing time after their recent injuries and simultaneously rest Gündogan and Hummels who they both replaced. Subotic took over Hummels’ spot as the left centre-back whilst the two midfielders swapped positions, Weigl moved to the right side whilst Sahin took over on the left. Dortmund’s defending worsened with the complacency and although Porto only mustered 0.9xg through the 90, they created a couple of good opportunities for themselves. It took a mixture of poor decision making from Porto’s forwards, such as Aboubakar’s attempted flick from within the 6 yard box in the 54th minute, and a strong goalkeeping display by Bürki to keep an away clean sheet. Although it was a poor performance from Dortmund, they managed to somewhat surprisingly come away with a win and they progress to the last 16 of the competition. Without needing to play at a high intensity, Tuchel’s side were able to see the game out on auto-pilot whilst the likes of Hummels and Gündogan get valuable rest. Considering the circumstances, the lack of a good performance could be considered irrelevant after they took the lead in the first half. The tie with Tottenham is by far the best of the draw and will certainly be an interesting match-up between two strong teams this year lead by two highly-regarded young coaches.